André Butzer at Carbon.12. All photos by the author. A leading art fair in the Middle East, Art Dubai opened its 13th edition during a busy March in the United Arab Emirates with the opening of Sharjah Biennial:14 and Galleries Night at Dubai’s Alserkal Avenue, where Rem Koolhaas-designed art space Concrete and newcomer Ishara Foundation greeted art-goers with new exhibitions. Art Dubai joined the festive month with an offering of more than 90 galleries from 40 countries. Hosting a large selection of galleries from the Middle East and Asia, the fair boasted exciting discoveries and established names of a gallery scene beyond the United States and Europe. Cultured contributor Osman Can Yerebakan selected his highlights from the fair that opened its doors on March 20th at Mina A’Salam by the famous Jumeriah Beach. The fair’s newly-added section Bawwaba introduces ten galleries displaying single artist booths, offering in-depth introduction to artists’ oeuvres. Poignantly meaning gateway in Arabic, Bawwaba includes galleries from Pakistan, India and the Philippines. Positioned right at the entrance to the fair, Karachi-based gallery Jhaveri Contemporary exhibits works by London-based artist Shezad Dawood, whose intricate illustrations on ceramic tiles with bright colors pay homage to Pakistan, his hometown. Created in various scales and hung vertically on walls or spread across the floor, the works weave nostalgia with timeless beauty and broad narrative impact of abstraction. Of the galleries exhibiting within Bawwaba, New York’s own Aicon Gallery, known for rostering careers of South Asian and Middle Eastern artists, hosts Pakistan-based Adeela Suleman, whose exploration of beauty in unconventional territories leads to draping hand-beaten stainless steel sculptures in gold or silver colors. Interwoven sequences of dead birds orchestrate curtain-like forms that reminisce domesticity and safety at first sight. However, the alarming nature of their content—with demised birds in disproportioned figures—prompts contemplation and mourning. Adeela Suleman, Wipe the Slate Clean 3, 2019. Istanbul-based gallery Sanatorium exhibits works by Turkish artist Yagiz Özgen and Farid Rasulov from Azerbaijan, two artists utilizing computer generated systems to complicate traditional methods towards minimal or expressive territories. Rasulov digitally covers interiors decorated in European fashion with Azerbaijani carpets and accentuates the settings with intrusions of animals, such as kangaroos and lynx brought down to robotic features. Özgen culls images from a website archiving NASA-supported telescope images of the space. For his meticulously-crafted abstract acrylic on canvas paintings, Özgen yields up to thousand color hues, stripping down data—once beyond the means of human capacity—into poetically minimal color formations. Palestinian artist Rana Samara’s “War Games” series bring vibrant colors of domestic settings into Ramallah-based Zawyeh Gallery’s booth, where the artist chronicles traumas of growing up against the backdrop of an unending war. Using the whimsy of video game aesthetics alongside the horrific results of war, Samara comments on notions of numbness and normalization gradually evident in war imagery, while using alternative perspectives and angles to capture the innocent gaze of a child in her acrylic and pastel paintings. Lego, a wall-covering illustration of marching colorful prosthetic limbs, is a stand-out. Among galleries from Dubai’s rapidly-growing art and design district Alserkal Avenue, where the city’s influential galleries The Third Line or Green Art Gallery are located, Carbon.12 joins the fair with a grouping of works by an international roster, including Iranian artist Sara Rahbar and California-based German artist André Butzer. 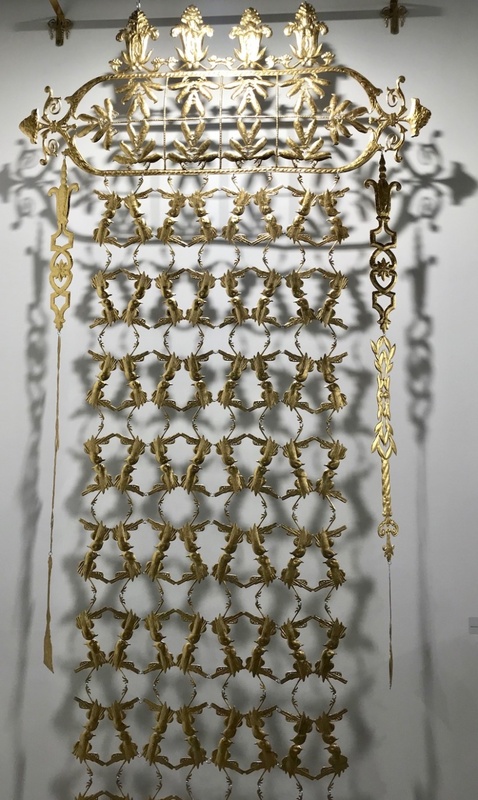 Rahbar, whose American flag sculptures made out of war gear is also a part of the Ford Foundation’s current group exhibition Perilous Bodies, exhibits a work from the same series with a sharp commentary on the complicated power dynamics of our current political landscape. In contrast, Butzer’s exuberant paintings of figures with loose gender definitions and cartoonish characteristics accentuate the booth with a burst of jubilance, captured most vividly through the artist’s reedition of bobbing eyes and childish attire. The Third Line’s neatly-hung booth includes works by Polish-Iranian duo Slavs and Tatars, L.A.-based Iraqi artist Hayv Kahraman, and Lebanese Fouad Elkoury, with pieces combining humor and contemplation to comment on ideas of home, socio-geographical dilemmas, and oppression. Slavs and Tatars’ mirrored maps or Kahraman’s folded drawings of bodies and geometrical forms in otherworldly juxtapositions both orchestrate a thought-provoking experience, which stands out as a delight at a fair setting. Art Dubai is open to public at Mina A’Salam through March 23, 2019.